This is not an official implementation of the turnstile. zcashd has yet to implement support for the Sapling turnstile. There is an existing proposal in the form of a ZIP and you can follow the progress of development here. ZecWallet is an individual implementation following the suggested privacy recommendations for implementation of the turnstile. If you are concerned, then wait until the official RPC tool is released into zcashd before migrating funds. The Sapling turnstile is an auditing mechanism for the number of ZEC in circulation. The Sapling turnstile provides accounting for the ZEC held in Sprout shielded addresses as they are migrated to Sapling shielded addresses. To achieve this, owners of shielded ZEC are required to send their balances to a transparent address before sending to Sapling shielded addresses. Creating new transparent addresses in your wallet to move from Sprout to transparent addresses. Splits the funds across multiple transparent addresses over multiple blocks. Uses round numbers to obscure any identifying information as these round number values, e.g. 10 will be very common in the blockchain. To start the turnstile migration tool, open it by choosing Apps->Sapling Turnstile and choose the Sprout address (zc) to migrate funds from and the Sapling address (zs) to send funds too in addition to the number of days you would like to migrate the funds over. Generally, increasing the option to migrate over a larger number of blocks is the preferred solution but note that there will be an increase in the number of transactions, all of which require a fee. The migrate over 4 days (2304 blocks) requires 10 transactions resulting in fees of 0.001 ZEC for the migration. Note that you may only perform one migration at a time using the app. Closing the wallet during the migration. If you shut down the wallet, then it’ll send any pending transactions on reopening, which may result in the undesired behaviour of multiple transactions occurring back-to-back. The wallet must be open for any transactions to be sent so you should open it frequently and preferably leave it open throughout. To check on the progress of the turnstile at any time, visit Apps->Sapling Turnstile and you will be presented with the migration progress and the number of blocks until the next transaction. 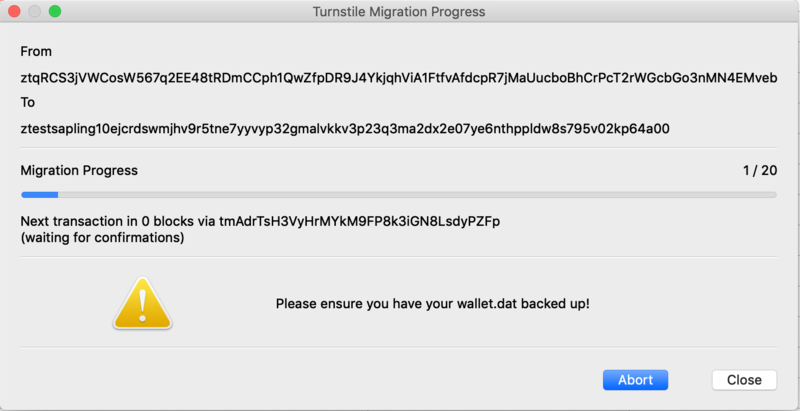 Backup your wallet.dat file after starting the migration. ZecWallet creates new transparent addresses for the turnstile migration. You must create a backup after confirming the migration to ensure you have the private keys for these intermediate transparent addresses in case there is an issue. To do so, visit File->Backup wallet.dat. If at any time you wish to abort the migration, visit Apps->Sapling Turnstile and choose Abort, and no further transactions will take place. After aborting, all the funds remain in the addresses when the migration was aborted.